We often receive different objectives from multiple stakeholders, which can be extremely confusing. The CEO wants to see banner ads plastered across popular websites. The Marketing Director wants the best click-through-rate in the industry. The Finance Director wants to grow revenue. So, who’s right at the end of the day? Achieving advertising success is often subjective, yet most of these objectives are just secondary metrics that latter up to one primary goal. Optimizing to maximize the efficiency of one metric may kill the success of another. Should I ask, what is a good return on advertising spend? At what point is my ROAS positively impacting profitability or value? At what point does efficiency start to inhibit growth? What other metrics eventually impact profitability or value? The end goal in utilizing advertising should be maximized returns whether that be profit or some other value point. One thing we do know, anything less than a 1:1 ROAS is bad for business; it means you’re losing money. However, as ROAS climbs beyond 1:1, you don’t necessarily make more money—as you’ll read further below. You can’t have the best of both worlds, but you can have a little piece of each. Break-even return on investment (ROI): Advertisers seldom have visibility into their client’s business costs (e.g., labor). Understanding the break-even ROI can help advertisers determine a good return on advertising spend—whether ROAS is profitable or not. 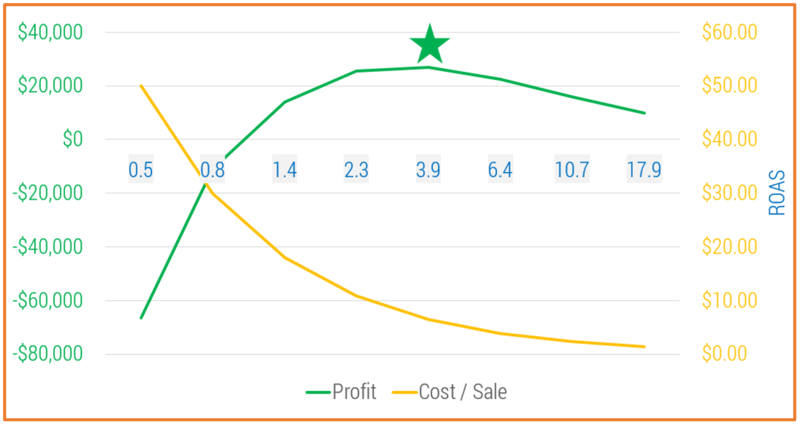 If a company breaks-even at a 2:1 ROI, then your ROAS needs to be above that and not 1:1. Value vs Revenue: In many cases, your goal may be implicitly intangible. It could be an offering, such as information for website browsers. Revenue is much easier to quantify as the value of information is completely subjective. Although difficult, it’s best to determine the value your client places on a particular action users perform. Performance Campaigns vs Others: Startups and new businesses/products/services alike don’t always make money at first or ever for that matter. It may be more important for them to invest in awareness. There are also other intangible objectives such as improved corporate responsibility or environmental consciousness, but for the sake of this article, we’ll focus on digital performance-based campaigns that are tangible and easier to measure. In the chart below, you can see the performance of various metrics in regard to particular ad positions. Consider all things equal (e.g., Sales / Click) as there are outlying factors that can influence these metrics. The best way to maximize your return is to optimize to Profit (or value like thereof). You may experience an agitated marketing manager who had a ROAS goal of 9:1. He may have shuttered at the 4:1 ROAS on his report, yet the finance department will shake your hand and throw a party with all the money they are making. As ad visibility improves, often does your click-through-rate. That means you get more clicks per impressions shown. Some of these clicks will then eventuate to sales. Advertisers pay for their ad position and premium placements have higher CPCs. The price you pay for a sale is influenced by CPCs. As your cost per sale goes up, profit margins go down. If we just focus on Profit Per Sale, you may think we can keep making more money as we become more efficient. However, there comes a point where volume becomes impacted. As you pay less per click, your ad position suffers and you attract less clicks, meaning, high cost-efficiency but diminished sales. By identifying the point of diminishing returns, we can also reverse engineer budget. We know that Profit is greatest at a $9.4K investment (via Chart 1); we should invest no more and no less. If you’re still asking ‘what is a good return on ad spend’, try expanding the picture. 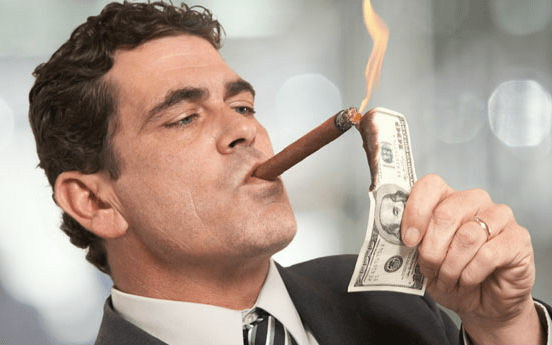 Efficiency could be killing your advertising success; if you still want that 9:1 ROAS, get your match ready, take your cash, and light a flame to it. Don’t optimize to CTR, CPA, or ROAS, optimize to Maximized Profit (or value like thereof). If you really want to stretch your brain, consider the Average Lifetime Value of your consumer. In short, a portion of your sales will be repeat customers, which means, your average profit per sale is much higher because you will receive multiple future sales off a past single ad click. There are also other factors that influence your advertising success such as the impact of multiple ads shown to a single user. That goes down the never-ending tunnel of attribution. But we’ll save that for another day.